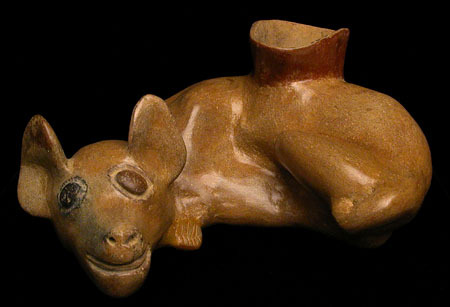 This Colima Dog, very caricature-like, with one black eye and one red eye, is curled into a crouching position with ears perked attentively. Dimensions: Height: approx. 4 in. (10.2 cm. ); Length: approx. 9 in. (23 cm.). Provenance: From a Riverside County, California collection of Pre-Columbian ceramic animals.